It’s Friday, which means I’ve been in Quito just about 3.5 days so far, and the city still feels very much like a giant nut I have yet to crack. But time does the crackin’, not me. I’m a little shaken up by the fact that, last night, two guys were robbed directly outside my apartment… at gunpoint… by three Ecuadorians. They were getting out of their car and the three guys literally came up to them, pointed a gun at their head, and said give me your keys. They handed them over. This happened probably five minutes (couldn’t have been more than seven minutes) after my roommate Kari and I left our apartment (which directly faces the apartment in front of which these guys parked) to walk one block north, where a bunch of Kari’s fellow teacher friends were having a dinner party (mmm, pulled pork). Scene of the crime. 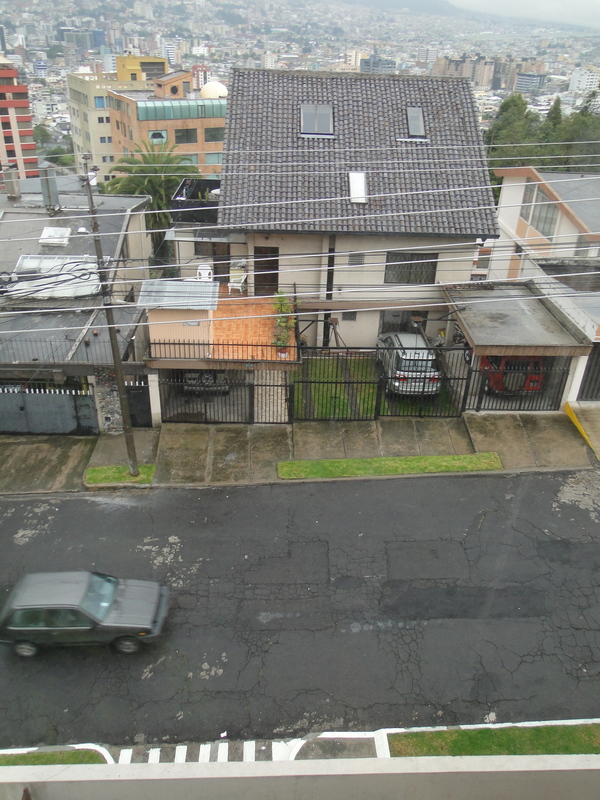 My street, Quito. I know it’s not safe here. Reminders are constant, and my guard has been constantly up. But I figure all you can do is be street smart. It’s hard for me to grasp the very firm rule both guidebooks and people on the ground seem to swear by: do NOT walk ANYWHERE – not even one block – at night. Meaning, if the sun is even partially down, take a taxi, even if you’re going around the corner. But let’s move onto some happier stuff, like my new job! I’m excited about it. For example, the first day, we celebrated two birthdays at lunch. Not only was there cake, but there was BEER. Niiiiice. Also, my coworkers are great. Like, really great. I’m excited about every one of them. Half the office is Ecuadorian, and half the office is British/American/Canadian. It became clear very quickly that the office works hard together… AND plays hard together. That’s my kind of office. For example, my second day at work, I went to dinner with my coworkers followed by Pub Quiz Night, which is run by… my boss. Hehe. Basically, you get in teams of five, and after a discussion that morning about our least favorite words, we came up with the team name “Moist and Crusty.” Yes, I’ve been laughing a lot already. I left halfway through the quiz (was still exhausted, but finally slept past 530am today — whoohoo!) but… we won. Good start. It’s about a 35 minute walk for me to get to work, and as long as I feel safe enough, I plan to walk it every morning. The walk begins by going down my four flights of stairs, then down a very big hill to an avenue called 6 de Diciembre, along which the ecovia (or tram) runs, for $0.25 a pop. The walk isn’t pretty if I’m looking down — dirtied cement buildings, car exhaust, and unattractive little tiendas line the avenue. I’ve had loads of crap blown into my eyes each morning (would it be inappropriate to walk to work wearing goggles?). But then, if I look up to my right, there they are: the mountains which, this morning, are made invisible by clouds. View from my bedroom this morning. Quito, Ecuador. All in all, things are off to a really good start, but not without a couple hiccups. I’m loving my coworkers, looking forward to my job (which will keep me very busy, I have the feeling) and hoping to give Quito a good crackin’ this weekend, since my exciting plan to head to a beach called Canoa with my coworkers foiled when Libby (the other new girl) and I tried to buy bus tickets and found that they were all sold out. Siiiigh. Asi es la vida. I have five keys. That’s how I get in. First, I must get up the big hill to my red door. The red door is metal and that’s the most important one because that’s the door that separates me from feeling vulnerable between the taxi and a locked door behind me. Then, I go up some steps, and there is a second door — a glass door. Then I go up three more flights of stairs, and I have a metal gate in front of my door. I open that. Then there is a dead bolt lock and a door handle lock. They all turn in different directions, some require the key to be jagged side up, some jagged side down. It’s a bit confusing, and I can only imagine how annoying it will be when I’m slightly tipsy. I had to put all the keys in order on my keychain because I can’t tell the difference between them, and I still haven’t memorized which ones turn which direction, etc. So, basically, every time I get home, it’s like this brain puzzle just to get back into my apartment, and it still takes me a few minutes. I guess it’s just another one of those things that I know will take time. Then some day, when I least expect it, I’ll realize I have it figured out, and it will be second nature, and I’ll have no trouble opening the doors to my new little life in Quito while letting old ones shut behind me. I’ve got the keys. Now I’ve just got to figure out how to use them. This song is a perfect fit to my mood right now: The Re-Arranger, Mates of State (ignore the poor quality video, listen to the song). At the risk of a massive jinx, I have never been robbed or been the victim of any crime in all of my travels. Let’s hope it stays that way. Follow the rules, T, and I’m sure you’ll be fine. Speaking of apartments doors/keys, the door of my first apartment building in France was something like 8 feet tall and just enormous. Like going into a castle. Also, the hallway to get to my apt. door was pitch black and had no light, so I would have to feel my way to get to the key hole. And then there was the time that my water boiler broke while I was gone which was like turning a fire hydrant on inside my apartment. Like Geordie says, keep to the rules and you’ll be ok. The incident is probably a blessing in disguise, first of all because it fortunately didn’t happen to you (although unfortunately to someone else!) so it doesn’t need to be an omen of things to come, but an early warning about being aware and watchful. Float like a butterfly, move like a lynx. (Compare and contrast with Mohammed Ali’s “Float like a butterfly, sting like a bee”) That’s the beauty of living in a distant place. All our assumptions are challenged, as they should. The world is full of danger and beauty. I think Geordie and Susanna said it all in terms of safety- so I won’t repeat it all, just stay safe! More importantly, I’m writing to say I love you and think of you often (yes, it’s only been a few days) but you’re starting such an exciting adventure and I can’t wait to hear more!